(Nanowerk News) An innovative drug-delivery system – nanoparticles encapsulating nitric oxide or prescription drugs – shows promise for topical treatment of erectile dysfunction (ED), according to a new study by scientists at Albert Einstein College of Medicine of Yeshiva University. The new system, tested successfully on a small number of animals, could potentially prevent side effects associated with oral ED medications, if study results can be replicated in humans. That could mean safer and more effective ED therapy for millions of men with heart disease and other health problems affecting erectile function. The study is published today in the online edition of the Journal of Sexual Medicine ("Nanoparticles as a novel delivery vehicle for therapeutics targeting erectile dysfunction"). Tens of millions of men worldwide have benefited from oral ED medications such as sildenafil (Viagra), vardenafil (Levitra), and tadalafil (Cialis). However, these medications - which belong to a class of drugs called phosphodiesterase type 5 (PDE5) inhibitors - have limitations. They can cause systemic side effects that can be serious. These side effects include headache, facial flushing, nasal congestion, upset stomach, abnormal vision as well as isolated reports of hearing and vision loss. Men who've recently suffered a heart attack or stroke or have severe heart disease should use these drugs with caution or not at all. In addition, "an estimated 30 to 50 percent of men with ED do not respond to oral use of PDE5 inhibitors," says senior author Kelvin P. Davies, Ph.D., associate professor of urology at Einstein. Nanoparticles developed by Einstein researchers can ferry drugs or other medically useful substances across the skin. 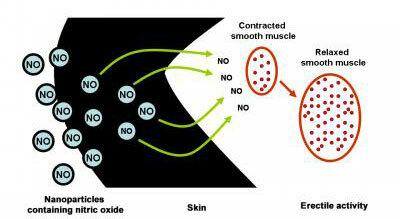 In this study involving rats, nanoparticles contained either nitric oxide (shown above) or nitric oxide plus the drugs sialorphin or tadalafil. When carried across the skin, these agents relaxed smooth muscle tissue, resulting in increased blood flow and erectile activity. The drug-delivery system, developed by Einstein scientists, consists of nanoparticles – each smaller than a grain of pollen – that can carry tiny payloads of various drugs or other medically useful substances and release them in a controlled and sustained manner. The limited number of topical formulations of ED drugs has so far proven ineffective. This study was done to evaluate whether the Einstein nanoparticles, which have been shown to penetrate the skin, might allow the targeted delivery of compounds that treat ED and thereby avoid the drugs' systemic effects. An effective topical therapy could be especially significant for those ED patients – particularly men with diabetes – who have reduced levels of nitric oxide (NO), the signaling molecule that dilates blood vessels responsible for erectile activity. These men, who often aren't helped by oral PDE5 inhibitor drugs, may benefit from direct application of NO or the PDE5 inhibitors. The nanoparticles were tested on a total of 18 rats bred to have age-related ED. The rats were divided into three treatment groups. One group of seven rats received nanoparticles encapsulating NO. A second group of five rats received nanoparticles encapsulating NO plus an experimental ED drug called sialorphin (which has a mechanism of action different from PDE5 inhibitors). A third group of six received nanoparticles encapsulating NO plus tadalafil (Cialis). Five of the seven rats treated with the NO-containing nanoparticles, and all 11 rats treated with nanoparticles encapsulating NO plus sialorphin or tadalafil showed significantly improved erectile function. None of the seven rats in a control group, which received empty nanoparticles, showed any improvement.